Diego Simeone's decision to put injured Diego Godin up front paid dividends as the defender scored a late winner to beat Athletic Bilbao. 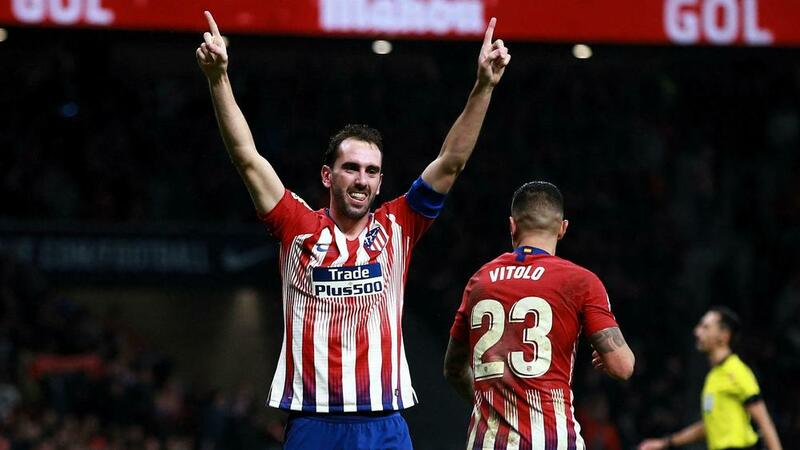 Atletico Madrid hero Diego Godin has revealed Diego Simeone instructed him to play up front for the closing stages of their dramatic 3-2 win over Athletic Bilbao on Saturday because he was injured. Uruguay defender Godin damaged his thigh trying to prevent Inaki Williams scoring his second goal to put Athletic ahead after Thomas Partey had pulled Atleti level. Simeone had used all three substitutions by that point and told the 32-year-old to see the rest of the game out in attack. That decision paid off handsomely as captain Godin plundered a stoppage-time winner after Rodrigo had levelled for a second time in the 80th minute. "In the Williams goal, I hurt myself in the sprint, I felt a sharp pain," he told beIN SPORTS. "I went to go off but Cholo [Simeone] told me to go up front. "We are going crazy with the win and this makes us all happy, along with the fans. "We fought to the end and we were rewarded." The victory moves Atleti up to second in LaLiga, one point behind Barcelona, who play Real Betis on Sunday.